"I just wanted to let you folks know how impressed I am with your company. I found a hairline crack in a wheel from my BMW 540i and called to see if I could drop it off for an evaluation this past Friday. Kim made an appointment for me at 11:00 on Saturday. (I thought it was kinda weird to need an appointment just to look at the problem). The next day when I arrived at the shop, they took a look, and said, "Sure we can fix that ... it will take about an hour." Holy $#!% ... YOU CAN FIX IT NOW! ... WHILE I WAIT??! 45 minutes later it came out better than new!! The workmanship was flawless. The cost was more than reasonable. The warranty is ironclad... what more could you ask for? The guys even took the time to discuss wheel refinishing options and NEVER USED HARD SELL TACTICS!! I will certainly be back for some future "projects" many times over!! Wishing you continued success for the next hundred years at least! Thanks WHEEL COLLISION CENTER." You can always ship your wheels to WCC by UPS (or Fedex Ground, or US Postal Service), but if you would like to bring your wheels in (or wheels and tires, if more convenient) or pick-up your repaired or new wheels - just click on the area you need directions from, print and go. 6. Follow signs for the Northeast Extension I-476 NORTH Towards the Lehigh Valley Exit 56 (old Exit 33). 8. After going through toll booth, keep RIGHT at the fork in the ramp. 9. Merge onto ROUTE 22 EAST towards Allentown. 12. At 4.2 miles, turn LEFT onto KEYSTONE DRIVE into the Airport Road Commercial Park. You will also see a sign on this corner for WHEEL COLLISION CENTER. 13. Follow KEYSTONE DRIVE (Watch the dip at the first cross street!) and take the last RIGHT onto PENN DRIVE. 14. WHEEL COLLISION CENTER is the 2nd building on the RIGHT (7286 PENN DRIVE). 2. Take the PA-309 SOUTH ramp. 3. Merge onto SR-309 SOUTH. 5. Take the PA-476 ramp (PA TURNPIKE entrance). 6. Keep LEFT at the fork in the ramp. 7. Merge onto 1-476 TOLL SOUTH. 2. Take the PA-283 WEST ramp towards PENNSYLVANIA TURNPIKE Harrisburg. 3. Merge onto SR-283 WEST. 5. Merge onto 1-283 NORTH. 6. Stay straight to go onto I-83 NORTH US 322 EAST Ramp. 7. Take the I-83 NORTH exit on left towards US-322 WEST/1-81 Hazleton/Lewistown. 9. Take the I-81 NORTH exit towards Hazleton/Allentown. 10. Merge onto I-81 NORTH. 11. Take the I-78 EAST exit towards Allentown. 12. Merge onto I-78 EAST. 14. Follow 22 EAST for approximately 10 miles and Exit onto AIRPORT ROAD NORTH (ROUTE 987 NORTH)....NOT South! 16. At 4.2 miles, turn LEFT onto KEYSTONE DRIVE into the Airport Road Commercial Park. You will also see a sign on this corner for WHEEL COLLISION CENTER. 17. Follow KEYSTONE DRIVE (Watch the dip at the first cross street!) and take the last RIGHT onto PENN DRIVE. 18. WHEEL COLLISION CENTER is the 2nd building on the RIGHT (7286 PENN DRIVE). 4. Take the 35 ST Exit on left towards 34 ST/DOWNTOWN. 6. I-495 WEST becomes ramp. 12. Merge onto I-78 WEST. 13. Take the I-78 WEST EXPRESS exit on LEFT towards GARDEN STATE PARKWAY/Clinton. 14. Take the Exit towards GARDEN STATE PARKWAY. 16. Take the I-78 WEST EXPRESS Exit on LEFT towards Clinton. 21. Continue onto PA on ROUTE 78 and go through the Toll Booth. 22. Continue on ROUTE 78 WEST and get off at Exit 71 onto ROUTE 33 NORTH. 24. Stay on ROUTE 22 WEST for 7 miles. 25. Then, Exit onto AIRPORT ROAD NORTH (ROUTE 987 NORTH) ... NOT South! 27. At 4.2 miles, turn LEFT onto KEYSTONE DRIVE into the Airport Road Commercial Park. You will also see a sign on this corner for WHEEL COLLISION CENTER. 28. Follow KEYSTONE DRIVE (Watch the dip at the first cross street!) and take the last RIGHT onto PENN DRIVE. 29. WHEEL COLLISION CENTER is the 2nd building on the Right (7286 PENN DRIVE). 1. Exit from ROUTE 80 WEST onto ROUTE 209 SOUTH via Exit 304 towards ROUTE 33 SOUTH. 2. Continue on 209 SOUTH for 7 miles. 3. 209 SOUTH becomes ROUTE 33 SOUTH. 4. Continue on ROUTE 33 SOUTH for 8 miles. 6. Turn RIGHT onto PA-512 SOUTH/ MOORESTOWN ROAD. 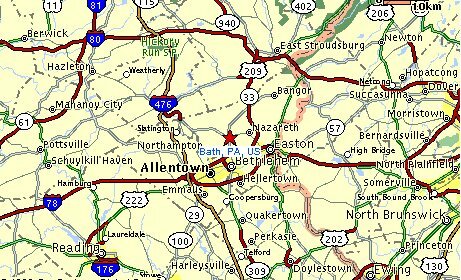 Continue to follow PA-512 SOUTH for 10 miles into Bath. 7. In the town of Bath, at the third traffic light, Turn RIGHT onto W MAIN STREET/ PA-248. 9. Follow signs for PA-329 WEST/ PA-987 SOUTH for 2 miles. 10. Turn LEFT at the Traffice Light onto ROUTE 987 SOUTH/ AIRPORT ROAD. 11. Go 200 yards/2 blocks and turn Right onto KEYSTONE DRIVE into the Airport Road Commercial Park. You will also see a sign on this corner for WHEEL COLLISION CENTER. 12. Follow KEYSTONE DRIVE (Watch the dip at the first cross street!) and take the last RIGHT onto PENN DRIVE. 13. WHEEL COLLISION CENTER is the 2nd building on the right (7286 PENN DRIVE). This page, and all contents, are Copyright (C) 1996-2007 by Wheel CollisionCenter, Bath, PA, USA.